In early February 2019, thirteen conservators and conservation students with wide-ranging professional backgrounds and experience traveled to San Juan to collaborate with our colleagues in Puerto Rico! A fascinating week of collaboration, symbiotic learning and exchange ensued. The objectives for the week included educating the participating conservators from North America about the issues conservators in Puerto Rico grapple with on a daily basis in a tropical environment. A second objective was to create an opportunity for the students from the University of Puerto Rico to attend a panel of emerging conservators from different programs in the United States and Germany to discuss the requirements and distinguish the differences among graduate level conservation study opportunities. 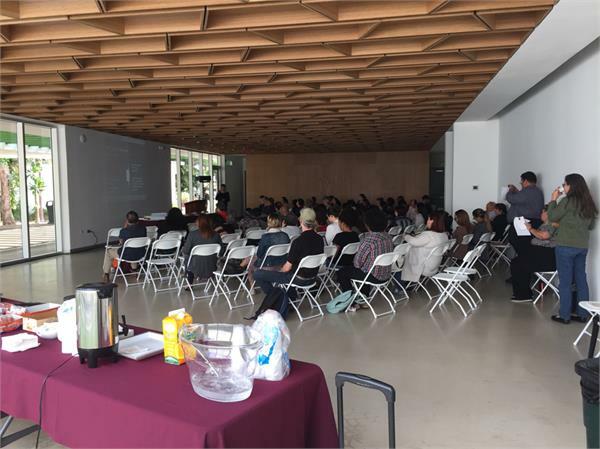 A third objective was to hold an all-day free seminar on collections care for museum professionals in Puerto Rico. A fourth objective was to undertake collections care work in tandem with Puerto Rican specialists at a pre-designated historic house much in need of cleaning. This was a full week! Our first day was spent with the National Park Service (NPS) professionals who gave generously of their time to show us in great detail the preservation work they are engrossed in which involves researching and preparing the best possible mortar recipe for the preservation of miles of 16th c locally-sourced sandstone fortification walls at the San Juan National Historic site. This site has significant importance because it was the entry into the New World. The preservation of these stone walls is a complicated and a continuous endeavor specifically because years of previous restoration attempts with cement need to be reversed now prior to the application of a safer, more historically-formulated (2:1, lime/sand) mortar. The reapplication of a more historically accurate mortar, must be consistently and continuously applied to the walls for this long-term preservation treatment to be ultimately successful. Together, the park, university and conservator are currently working in the development of a preservation and conservation training program for the parks masons and stone workers. An additional visit to the NHS Archives of 600,000 accessioned artifacts was impressive. The rehousing materials were state-of-the-art. In association with the San Juan National Historic Site, but housed in a separate near-by location overlooking the ocean, was another stabilization project focused on the preservation and conservation of cannons, cannon balls and artillery shells. This project re-started in 2013 and is on-going. There are four completed cannons; two bronze, two iron, and more than a hundred and fifty shells; they are on exhibition inside both San Cristobal and San Felipe del Morro fortifications, while four more cannons and 16 shells are under electrolysis treatment. On schedule for preservation treatments are 16 other cannons and few hundred cannon balls and shells. Technical research has been on-going in Habana, México City, Segovia and the US to learn more about the cannons manufacturing and history of use in general. One of the most important objects of the collection is a 19th century Spanish cannon from Segovia. The Ordonez 15mm cannon took the first shots fired to the US Navy from the forts in the Hispano American War of 1898. Donated by the Spanish government in the 1950’s and known to have been in stable condition then. By 1984 the metal carriage and cannon tube showed advanced corrosion and deterioration and was sent to Florida for electrolysis and preservation treatments. By 2008 the cannon surface and some structure components were again corroding and deteriorating rapidly. The cannons were stored on site until the project restarted. An in depth discussion regarding the deteriorating and previously treated carriage for the cannons was led by University of Puerto Rico Physics Professor Dr. Esteban Fachini, who is spear-heading preservation and conservation through reliable material characterization of original materials as well as of previous restoration treatments. Despite the electro-chemical stabilization method for chloride removal from the metal core, followed by mechanical cleaning of corrosion concressions using hand and pneumatic tools, the application of a corrosion inhibitor and a final protective coating, the aggressive saline coastal environment will continue to pose exhibition challenges going forward. One component of the project involves the collection of environmental data and the study of these conditions in relation to deterioration in order to establish a preservation and maintenance program for the artifacts treated. Of greatest importance will ultimately be to ascertain if the restored carriage can support a 14,000 pound cannon tube. A tangential discussion ensued regarding potential options for exhibition of this sizable cannon and carriage once it has been stabilized and given the expressed desire to place them in their proper context, out-of-doors. This project would welcome more conservation students as is one of the project components, education and outreach. Another exciting future preservation project will hopefully entail the preservation of stunningly detailed “graffiti” ship drawings drawn on the walls of sub-floors within the San Cristobal 16th century Spanish fort. These images absolutely mesmerized the group. See below. Meeting the team of dedicated preservationists and historians at the NPS underscored their commitment to these long-term goals. Funding will be sought in the future for this preservation project. On the second day, we focused on the future of the field by participating in a panel of emerging and young conservation professionals which Cesar Pineiro arranged and spear-headed with approximately half of our visiting group as panelists. Professor Fachini was instrumental in the success of the event as he provided additional context to all of the attendees. 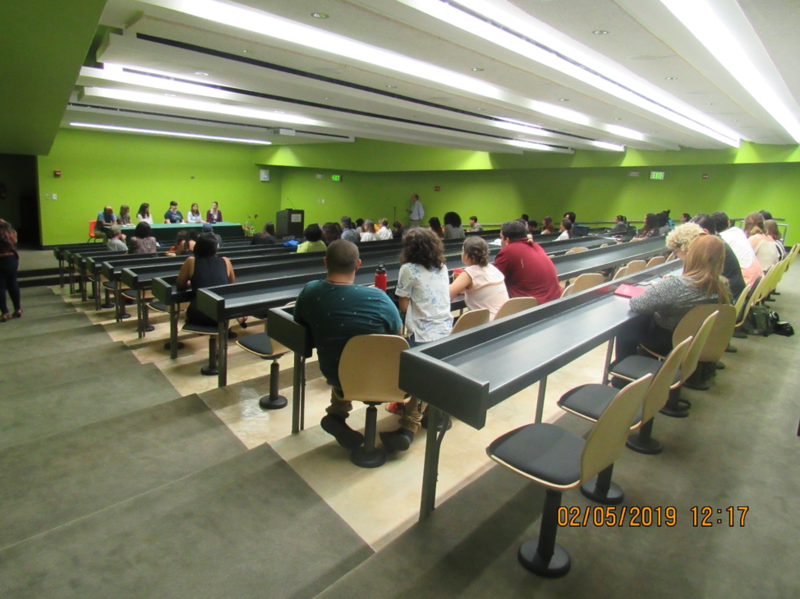 This was an extremely important event because it gave the undergraduates at the University of Puerto Rico the opportunity to ask specific questions and to learn more about conservation and museum studies programs that would be available to them in the States and abroad. This event was well attended and there were copious questions regarding both conservation graduate programs and museum studies programs. It was important to create opportunities for direct contact with interested undergraduate students at the University level. Hopefully as a result of this opportunity more students from Puerto Rico will be encouraged to apply for advanced conservation graduate school training. While it was heartening to see how many undergraduate students were interested in learning about opportunities for graduate study, it was sobering to learn how little they knew about the conservation programs and how much more work we all need to do to disseminate the information to them more effectively. 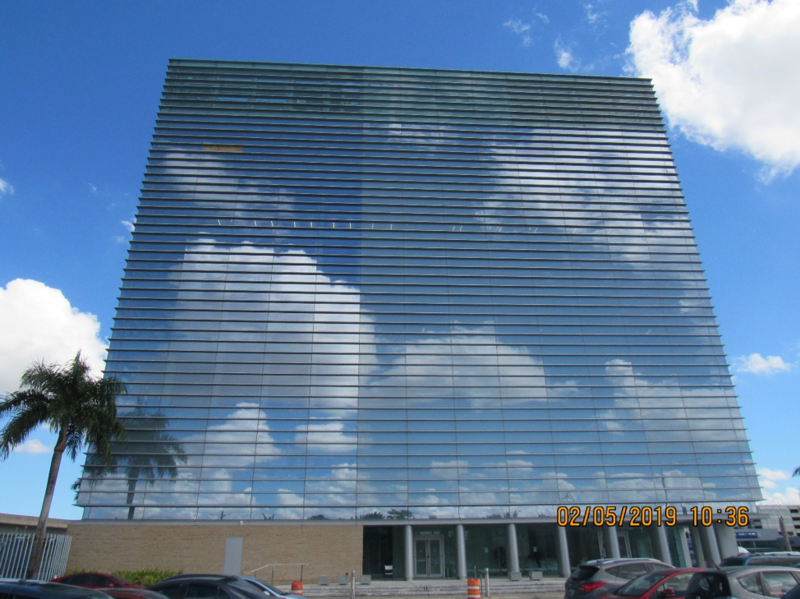 Another exciting interaction our group had that same day was a detailed tour of the Material Characterization Center located at the Rio Piedras Campus of the University of Puerto Rico which was led by Professor Fachini. Professor Fachini accompanied us throughout the entire week and provided context and historical background for everything thing we experienced. There we were also greeted and toured around by Dr. Carlos Cabrera, PhD., Professor of Chemistry. There is a staff of 15 and 10 technicians. This center is a state of the art analytical laboratory with all of the instrumentation required for the analyses of materials typically sought after in art conservation. Of particular significance to many of us was the x-ray photo electron spectroscopy microscope that could profile surface layers on ceramics, metals and glass. This facility not only serves the local academic and business communities but undertakes very important medical research on HIV AIDS and cancer diagnostic treatments. 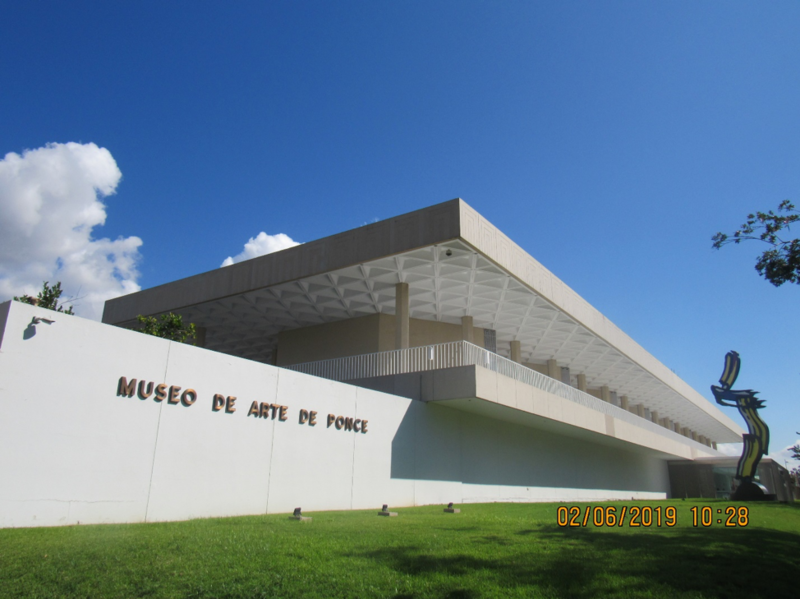 On the third day of our visit, we toured the Objects, Paintings and Paper Conservation labs at the Museo de Arte de Ponce located in Ponce along the southern edge of the island. At this time we learned that one of the most challenging aspects of running a conservation lab in Puerto Rico is the high cost of shipping any conservation materials to Puerto Rico which essentially amounts to twice the cost of the material itself which makes it often prohibitive to do so. In general, to ship by plane is quite high in cost but quick and tax-free, while to ship by boat is more economical but significantly slower and is also taxed. The conservators working at the Museo de Arte de Ponce offer public tours once a month and also take in private work to augment the museum’s revenue. One of the paper conservators we met will be presenting this year at the AIC poster session about a large portable hospital-grade chamber, complete with an HEPA filter, which they use for treatments and which they have shared, gratis, with other institutions to mitigate mold on works of art and for condition reporting purposes most notably after Hurricane Maria. On the fourth day, many of us participated in a collection’s care seminar which was free to all “museum staff of cultural property institutions” on the island. This seminar was held at the Fundacion Luis Munoz Marin and was well attended. In the seminar we covered the following topics: basic preservation and care of furniture and wooden objects (presented by Cesar Pineiro), basic preservation of organic objects (presented by Ingrid Neuman), basic preservation of inorganic objects (presented by Carol Snow), basic preservation of care of textiles (presented by Morgan Carbone), basic preservation of paintings (presented by Isabel Schaefer), basic preservation of care of books (presented by Candida Pagan), care of paper (presented by Debora Mayer), basics of storage on a budget (presented by James Cain) and federal grants for collections preservation, care and conservation (presented by Marc Williams). The detailed information presented on the current requirements of very specific grants appeared to be especially useful for the participants as it generated many questions during the Q & A session. Additionally we received a tour of the historic house, collection storage and the archive from the Director of the Archives and Collections, Julio Quiros. The generous hospitality of the staff as well as a reception for all of the day’s participants was provided by a local benefactor, Destileria Serralles, and was very much appreciated. 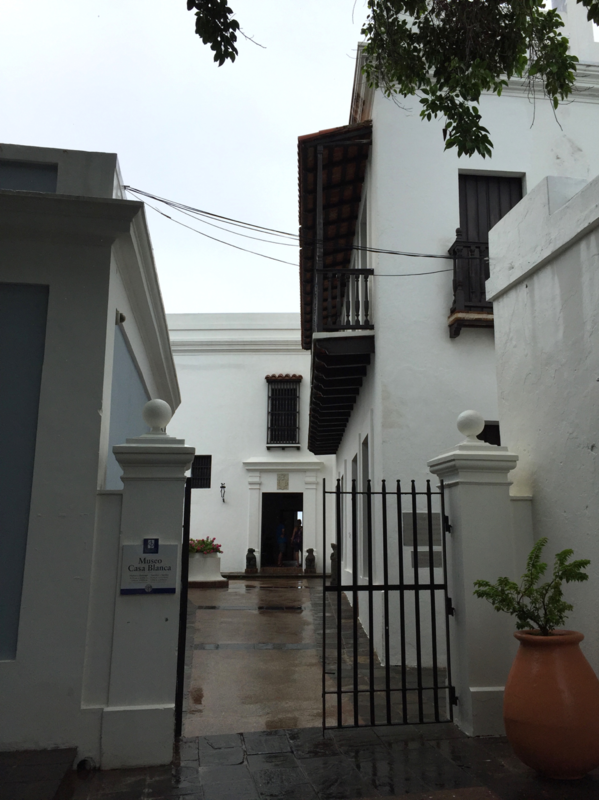 On the fifth and final day of this extraordinary week, we assembled for a day of cleaning at Casa Blanca, a circa 1521 century Spanish historic house in old San Juan. There we met the six individuals who staffed the house and we cleaned alongside one another. Together we cleaned metal, wood, textiles and ceramics. Some active infestation of a wood-boring insect was discovered during the cleaning process but fortunately was isolated in a display mount. As the windows do not possess glass or screens, insect activity is challenging here. Other recent evidence of insect activity included web-making clothes moths. Insect activity is particularly challenging for collection care professionals in Puerto Rico. Of particular interest, we learned about the Formosan termite, Coptotermes Formosanus, which also chews through plastic! 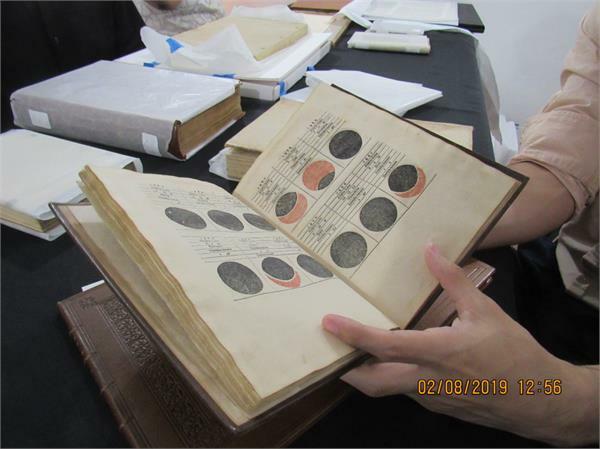 Some of the book and paper oriented conservators also visited the Casa del Libro in Old San Juan later that day. There we met with the Director, the gallery assistant and the Registrar, who generously shared with us some of their most spectacular and rare volumes from the 14th-19th centuries. We were also able to view older documents signed by King Ferdinand and Queen Isabella of Spain. What a treasure trove that museum holds. However as a result of a prior renovation and Hurricane Maria, at least one of their storage areas is in need of serious repair and many of their formerly working printing presses require preservation themselves. All of us would like to thank Marc Williams and Cesar Pineiro who developed this unprecedented opportunity to come to fruition. This one week long collaborative learning process was the result of their own 30 year professional friendship originating from their first interaction as teacher and student during Smithsonian’s’ Furniture Conservation Program of the late 1980’s. We are all greatly indebted to these leaders in our field and to their commitment to create such a valuable cultural and professional exchange such as this. There is a great need to return to Puerto Rico and to continue the dialogue in order to expand upon this recent visit. Please consider joining us at the AIC meeting this year for a recap of the trip and to see how you can become involved in future endeavors such as this. We need more Spanish speaking conservation professionals to come forward to carry on the professional connections that have been started. We welcome any level of interest and are available to answer any questions. If you are interested in getting together with members of this recent initiative at the upcoming AIC meeting in May, please contact Ingrid at ineuman@risd.edu. For further information on how you can become involved in potentially future iterations of this project, please contact: Cesar Pineiro at cesarpineiropr@gmail.com. 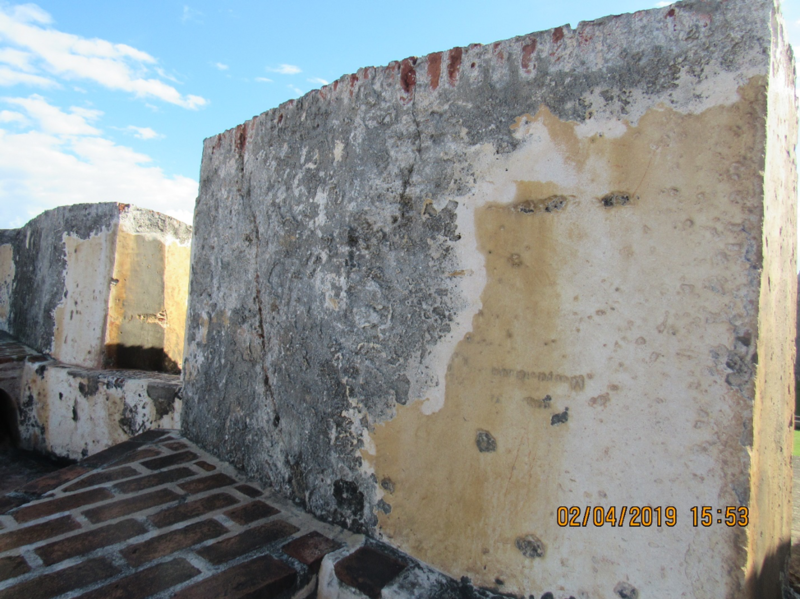 Deterioration of mortar and walls, San Felipe del Morro and San Cristobal forts, Old San Juan, Puerto Rico. 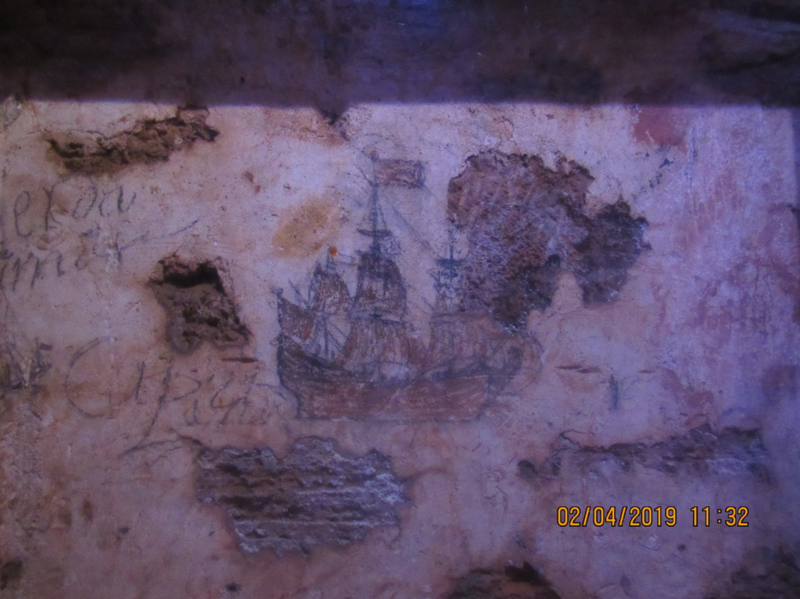 17th c ship graffiti, San Cristobal fort, San Juan National Historic Site. Student conservation graduate program panel, University of Puerto Rico. Material Characterization Center, Rio Piedras Campus, University of Puerto Rico. Conservation Laboratories, Museo de Arte de Ponce, Puerto Rico. Seminar on collections care for staff of cultural property institutions and museum professionals at the Fundación Luis Muñoz Marín. Casa Blanca, site of collections care project, 1521 historic house museum, Old San Juan. Casa del Libro, rare books collection, Old San Juan. Cannon project led by Cesar Pineiro and Dr. Esteban Fachini, Professor, Physics Department, Estudios Generales Faculty with Mr. Santiago and a host of conservation students and volunteers. Luis Munoz Marin was the first governor elected by the people of Puerto Rico.